Pathogens use effector proteins to manipulate their hosts. During infection of tomato the fungus Fusarium oxysporum secretes the effectors Avr2 and Six5. Whereas Avr2 suffices to trigger I-2-mediated cell death in heterologous systems, both effectors are required for I-2-mediated disease resistance in tomato. How Six5 participates in triggering resistance is unknown. Using BiFC assays we found that Avr2 and Six5 interact at plasmodesmata. Single-cell transformation revealed that a 2xRFP marker protein and Avr2-GFP only move to neighboring cells in the presence of Six5. Six5 alone does not alter plasmodesmatal transductivity as 2xRFP was only translocated in the presence of both effectors. In SIX5-expressing transgenic plants the distribution of virally expressed Avr2-GFP, and subsequent onset of I-2-mediated cell death, differed from that in wild type tomato. Together the data shows that in the presence of Six5 Avr2 moves from cell-to-cell, which in susceptible plants contributes to virulence, but in I-2 containing plants induces resistance. Figure: Avr2 and Six5 co-localize in the cytosol and nucleus of agro-infiltrated N. benthamiana cells. 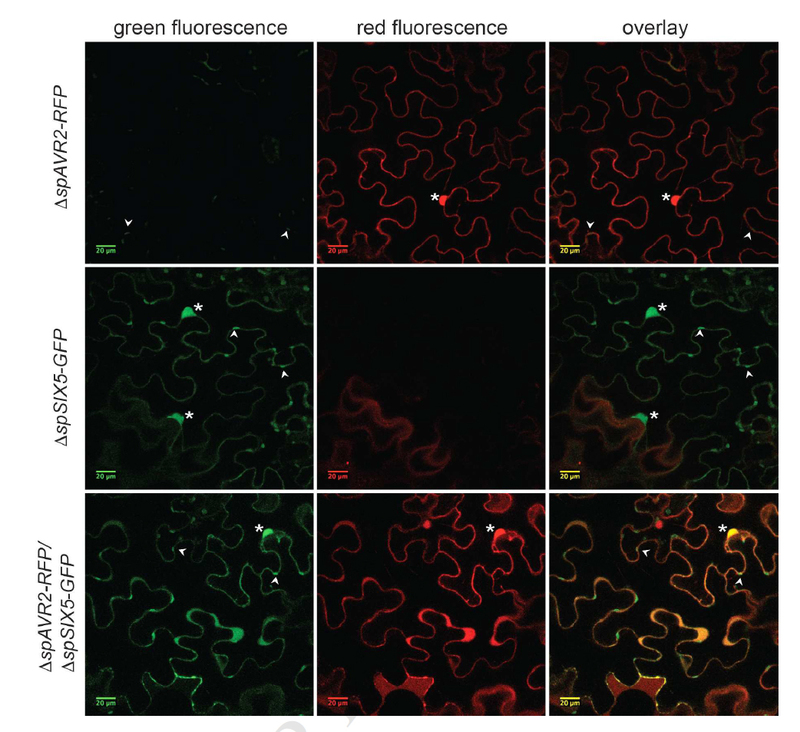 ∆spAVR2-RFP, ∆spSIX5-GFP or ∆spAVR2-RFP/∆spSIX5-GFP were expressed in N. benthamiana leaves using agro-infiltration, and fluorescence was monitored using confocal microscopy. In ∆spAVR2-RFP expressing N. benthamiana leaf epidermal cells red fluorescence was observed in the cytosol and nucleus (labeled with *). Green fluorescence, following ∆spSIX5-GFP agro-infiltration, was detected in both the cytosol and nucleus. Yellow fluorescence shows the co-localization of Avr2 and Six5 in cytosol and nucleus following co-infiltration of ∆spAVR2-RFP and ∆spSIX5-GFP. Green fluorescent chloroplasts are marked by arrowheads. The research, carried out at Molecular Plant Pathology (SILS-FNWI) including microscopy work at the van Leeuwenhoek Centre for Advanced Microscopy and was published in the journal Molecular Plant (http://www.cell.com/molecular-plant/abstract/S1674-2052(18)30061-3).